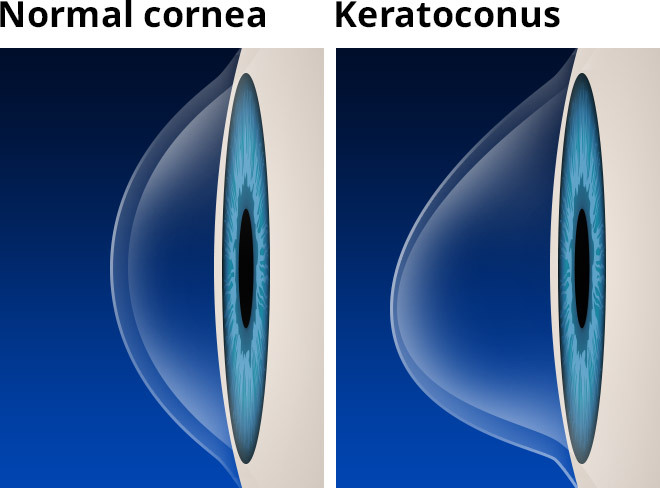 Keratoconus (KC) is a thinning of the cornea that can significantly interfere with vision. Instead of being round and smooth, it bulges at its thinnest point which causes distortion and warpage as shown in the pictures below. It usually affects both eyes, but at different degrees. This distortion has been compared to viewing a street sign through your car windshield during a very bad rain storm. Its progression is generally slow and can stop at any stage from mild to severe. As KC progresses, the cornea becomes thinner and bulges even more producing more distortion and scarring. Usually vision, can only be fully corrected with contact lenses. Glasses can only provide partial correction. Light first enters the eye through the surface of the cornea, which is the clear dome covering the colored part of the eye (iris). You cannot see the cornea except if it is scarred. Contact lenses are fit and rest on this part of the eye. It is the cornea that gathers and focuses the visual images ,which then travel to hopefully focus on the back of the eye. 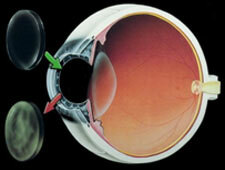 The cornea is masterfully engineered so that only the most expensive manmade lenses could ever match its precision. The smoothness and shape of the cornea is as vitally important to its proper functioning as is its transparency. If either the surface smoothness or the clarity of the cornea suffers, vision will become distorted. Although we can tolerate very large scars on our bodies, even a minor scar on the cornea from progressive KC can impair one's vision permanently. No matter how well the rest of the eye is functioning, if the cornea is scarred, clouded, or distorted, vision will be affected. Keratoconus (KC) is a bulging of the normally rounded cornea, from a weakening of the collagen layer of the cornea, producing distorted vision. It is estimated to be prevalent in 1 out of 2000 patients. KC has been known for at least two centuries. The causes of this affliction are still unknown despite our long familiarity with it. One opinion is that keratoconus is genetic, and it would make sense. However, we have treated hundreds of KC over the years and have never seen it passed down to an offspring. Another theory is that KC represents a degenerative condition. This also has merit as KC can start in the late teens and progress from there. Still a third postulation is that KC is secondary to some disease process. We have seen KC associated with patients that have lots of allergies and have a need to vigorously rub the eyes. Another less widely held hypothesis suggests that the endocrine system may be involved. This idea gained some credence from the usual appearance of the disease at puberty. At the end of the day, no one really knows the exact cause of KC. Bulging cornea due to a thinning and weakening, causes distortion that can be usually corrected with a rigid gas permeable, scleral, or a hybrid contact lens (gas permeable center molded into a soft lens). There are newer soft lens technologies that will also provide good vision and comfort in some cases. The first indication of KC is a blurring or distortion of vision. In the early stages, it may be corrected with glasses; frequent changes in prescription may be required. The continued thinning of the cornea from weakened collagen will make it impossible to correct one's vision with glasses. This progression tends to last for 5 to 10 years and then levels off. Occasionally, if there is rapid progression, scarring can develop in which even contact lenses can not correct. If the scarring is central and the vision is diminished to a point of causing lifestyle changes, then the only option is a corneal transplant. causes a permanent reduction in vision with progress rapidly and, in the advanced stage, the patient may experience a sudden clouding of vision in one eye that clears over a period of weeks or months. 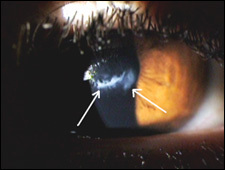 This is called "acute hydrops" and is due to the sudden infusion of fluid into the stretched cornea. In advanced cases, superficial scars form at the apex of the corneal bulge resulting in more vision impairment. 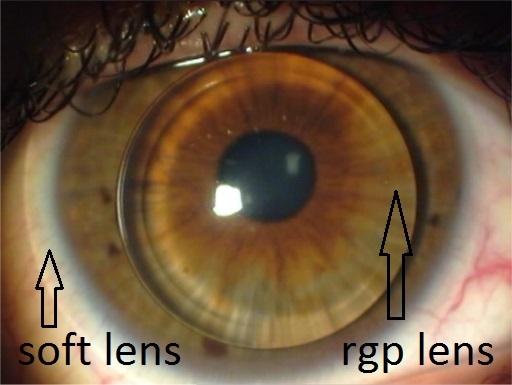 Rigid gas permeable contact lens. Piggyback: RGP fit over a soft lens. In the earliest stages of KC, ordinary eyeglasses may correct mild myopia (nearsightedness) and astigmatism that is experienced. As the disease advances, rigid gas permeable, scleral, or hybrid contact lenses may be the only way to correct vision adequately. Most of the time, this is a permanent remedy. These must be fitted with great care, and most KC patients need frequent checkups and frequent contact lens changes to achieve good vision and comfort. In some instances, the use of a rigid gas permeable contact lens on top of a soft contact lens (so called piggy backing) provides an alternative solution. It should be noted that technological advances in both gas permeable contacts and soft contacts offer more and more possibilities for keratoconus patients. However, rigid gas permeable or scleral contact lenses still offer the best vision. There is a new lens out that is gas permeable in the center and has a soft lens "skirt" attached to the periphery. This helps those who can not tolerate the feeling of rigid gas permeable lens (RGP). Contact lens wearing is definitely the preferred method of managing KC until surgery is necessary. In only about 10% of KC cases, a corneal transplant becomes necessary. In this process, much of the central cornea of the KC patient is removed and is replaced with a donor cornea. Eye banks in major cities collect healthy corneas from decedents and fulfill requests from eye surgeons for these corneas. This is a highly organized and sophisticated system, and corneal transplants are quite common and very successful operations. The probability of rejection is less than that of any other transplanted organ simply because the cornea has no blood supply. Rejection of other organs is usually due to incompatibility between the donor and the recipient and is mediated by blood cells. While there is a 95% rate of success in corneal transplants for KC, this procedure, as with all operations, involves potentially serious risks. In cases where the first transplant is not successful, a second can be undertaken successfully but is extremely rare. Permanent loss of vision, though also extremely rare, can occur. Corneal transplantation is considered only in those cases in which contact lenses cannot be worn or provide inadequate vision despite the most skilled efforts. While the surgical transplantation of a new cornea will resolve the basic problem of corneal surface irregularity, eyeglasses/contact lenses are almost always needed after surgery for adequate vision correction regardless of the skill of the surgeon. 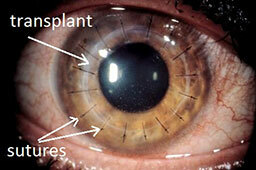 What is involved in corneal transplant surgery? Stitches are removed after 9-12 months. In the late 20th century, eye surgery has reached a remarkable level of efficiency, effectiveness, and relative comfort. Corneal transplant surgery is the most successful of all transplant procedures, and techniques are improving constantly. Either general or local anesthesia can be used in this procedure. Most people experience surprisingly little pain or discomfort following the surgery. Time off work will vary with individuals and the kind of work they do. Generally, with a sedentary job the patient should be back to work in a few days to a couple of weeks. The surgeon uses high-tech instrumentation to remove the distorted cornea and to cut out a similar "button" from the donor cornea. Looking through a surgical microscope, the surgeon places the donor cornea button in the round hole of the patient's cornea and stitches them together with sutures much finer than a human hair. It takes six to nine months before vision stabilizes, and eyeglasses or contact lenses can be prescribed. Individual cases vary a great deal; therefore, time frames mentioned above are very general. Be alert to any changes in your eye condition or in your vision. If you experience blurring, scratchiness, irritation, watering, or any discharge, you must contact your eye care practitioner. This may signal a problem with your eyes' tolerance of your contact lenses or the need for refitting. You should, of course, take normal care of your eyes and avoid the use of any substance not prescribed by your eye care practitioner. Women should be careful about cosmetics. Everyone suffering from KC should wear goggles when swimming and safety glasses when engaged in yard work or athletics.